Mickey Mouse Clubhouse: I Minnie has been packaged to include five, fun-filled episodes – each underlining the themes of friendship, teamwork, sharing and problem solving – and an all new bonus feature "You’re Invited to Minnie’s Birthday Party," as well as two complimentary Best Friend necklaces to keep as mementos and/or to share with a very special someone this Valentine’s Day. * Minnie & Daisy’s Flower Shower (All-New, Never-Before-Seen) – The botanical highlight of the year is in trouble, unless Minnie and Daisy can get their flowers to bloom! Together, they board the glove balloon to help coax the clouds to sprinkle much needed rain. * Daisy’s Dance -Clap your hands and tap your feet! Join Daisy, as she gets ready for one of the most important events of her life–performing in the big talent show! * Daisy’s Pet Project – The Pet Parade is almost here and Daisy needs to find the perfect animal for which she can love and care. But it’s not as easy as she thinks and soon she has three new friends: an elephant named Bubbles, a giraffe called Longfellow and a bunny called Captain Jumps-a-lot! * Minnie’s Rainbow – After a brightly colored rainbow appears over the clubhouse, Minnie searches for the pot of gold that’s supposed to be at its end. Along the way, she meets a leprechaun and discovers that not all treasure turns out to be as she expected! 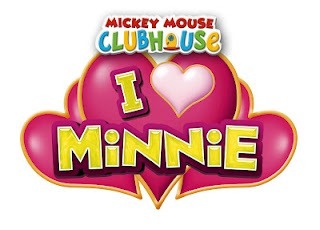 * Minnie’s Birthday – Today is Minnie’s birthday, but the Mickey Mouse Clubhouse friends need to set up her birthday party. 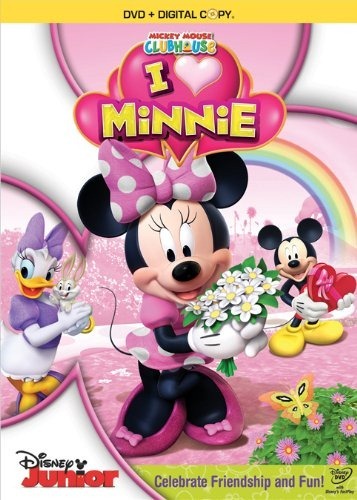 Minnie Mouse is one of our favorites and this disc is no exception. The best part of this set is that it includes a digital copy so you can put it on your iPad or other device. ONE OurKidsMom reader is going to win a copy of MMC I Heart Minnie on DVD! This giveaway ended at 11:59 PM EST on March 29, 2012. They have recipes along with crafts . Something for everyone! the crafts are wonderful! the color section! I did not know that they had various recipes. I like how there are stories that they read to you and the words are highlighted as they read. I love how stories are highlighted as they read! I love the craft section the recipes, especially the mickey mouse piazzas, so cute! I learned that they have fun games and stories my kids LOVE! The stories section is great! I like the crafts, but my son likes the videos! I learned my daughter can watch episodes right on their website and I can print her things. I like the Donald of the Desert video and many of the others! Love that your able to watch episodes on the website for MMCH. I love all the fun games!! Love the games the kids can play on their site. we like color pages most! I like the crafts section. My 4yr old loves crafts and these would keep him occupied on rainy days. I learned that they have several full episodes of Mickey Mouse Clubhouse that you can watch right from the website. We love trying all the fun recipes. I love the color and create section. I like the coloring pages to print for my daughter who loves Minnie Mouse. I entered to win Dora’s Easter Adventure DVD! I really like the games. Thanks for having this giveaway. I love that there’s episodes on the website. I love the veggie skateboards! I learned that you can watch episodes right on their website! Entered: Explorer Touch Mouse, Kindle Fire, Buydig.com, $100 Old Navy gc, and ipad 2 giveaways. We like how you can see some of the cute programming they have. I love that there are game and activites! have stories, games, coloring pages, etc for the kids on that site. My daughter just played ALL the Toodles Story games.. she loves them! I like that full episodes are on the website. I learned that it is on every morning at 8/7c on disneyjr! I like the games on the website. Thanks for the chance to win! I entered the Litter Robot Giveaway! I like that you can watch some of the video’s on the web site, that is really neat. They have 3 full episodes you can watch online. I have a young cousin who is practically my niece who would love the MMCH website. I really like the fact that they have full episodes on the site, which I find to be pretty rare these days. I learned that they have fun games and activities. Love the crafts section, so many cute things! My nephew loves to play the games on their website! My GFC name is Aunt Maggie Rocks. I didn’t know about the recipes either. I like the coloring pages as well. I like the color and create ideas. i learned there are a bunch of cute, fun online activities for kids! They have fun games for kids. I liked the story of Donald and the Beanstalk! Thank You! Entered: Kindle Fire, Buydig.com, $100 Old Navy gc, Explorer Touch Mouse, and ipad 2 giveaways. I love that they have stories right on the website. Stories, crafts, so much great stuff. I like mini mouse on their page. Entered: Kindle Fire, Buydig.com, Bake Pop, Explorer Touch Mouse, and ipad 2 giveaways. Entered ShaveWell, BuyDig.com, Ebates, Bee Savvy iPad, & Happy Napper GAs. Entered: Kindle Fire, Buydig.com, Explorer Touch Mouse, Bake Pop, and ipad 2 giveaways. Entered $100 eBates giveaway and Dora Easter DVD. I like the Color & Create section on the website. I am very exited that the new show Doc Mcstuffins that is coming out soon. It looks really cute and cant wait to see a new show. Entered: Kindle Fire, Buydig.com, Litter Robot, Explorer Touch Mouse, and ipad 2 giveaways. I learned that they have fun games and stories. Entered: Kindle Fire, Buydig.com, Explorer Touch Mouse, Litter Robot, and ipad 2 giveaways. Entered: Buydig.com, Explorer Touch Mouse, Litter Robot, and ipad 2 giveaways. I learned that this is a very child friendly site where children can safely play games. Entered: Buydig.com, Litter Robot, Explorer Touch Mouse, and ipad 2 giveaways. Entered: Buydig.com, Explorer Touch Mouse, ipad 2, and Litter Robot giveaways. I love the crafts and the recipes! I love that there are games and coloring right on the site. Love the games on the site! My daughter loves Mickey Mouse Clubhouse! I like that they have full epsisodes to watch right on the website. I loved the coloring pages! I didn’t know they were there. My daughter is a HUGE MMC fan and I know she’ll love to color all of these pics! I like all the games including the St. Patrick’s Day game. I like the the craft section. I like that they have coloring pages. I love the great craft ideas! I love the color and create section! I like Goofy’s Wild Shoe Round-Up. I found ABC stories on the sight (like Donald and the Beanstock). I entered the March Moola giveaway. I entered the giveaway for the Dora DVD. I like the downloadable coloring pages. My granddaughter loves to help in the kitchen and the recipes are great. Wow, I learned that they have recipes listed on their website. Awesome! I like the coloring and create section of the website! Tam S.
The variety of games are great for my grandkids! I love the kid friendly site. The games are fun and my granddaughters love it. I have posted your button on my timeline / Diane K. Brimmer. I like that they have full episodes on the site! I like Mickey’s Out of this World Treasure Hunt game. You can print off pages for kids to color from the website. I like the craft section for sure! All the games and the coloring pages. I was really suprised that they had delicious recipes I think my children will love. Thank you for the opportunity to win this. I like all the coloring pages the site has. My fave is the Coloring & Create section! I liked the games on the website.